Hey guys I’m now 11 months into my Invisalyn experience and I’m back with a quick update from my previous blog to inform you how I’m getting on. I started to see a dramatic Improvement at Set 22/23. Literally it just happened over a few days I was amazed. My cross bite began to shift across, which was the main reason I wanted to get Invisalyn, to correct the problem. My upper and bottom set of teeth started to shift into position and link together in harmony. I recently finished my final set of 27. Upon my last visit to Dean Street Dental Co.Kilkenny, I had my attachments at the front removed and I got new moulds taken for my refinement stage. A refinement stage is the final process which corrects minor details. My bite needs to be slightly altered to make it 100% . In my opinion they look perfect but my denist is a perfectionist and wants them spot on. I hope to have my moulds back by christmas week or the start of the new year. I will have approximately 10-15 more sets which I will change weekly. I have got into a routine of wearing my retainers every day and night, I now feel weird when I’m not wearing them a few more weeks wont kill me. I was giving a home teeth whitening treatment which I place into my trays over the next few weeks. This was included in my treatment plan. So I will update you on my teeth whitening process in the oncoming weeks. This was at set 24. Lashes are a must have in my kit when creating makeup looks. 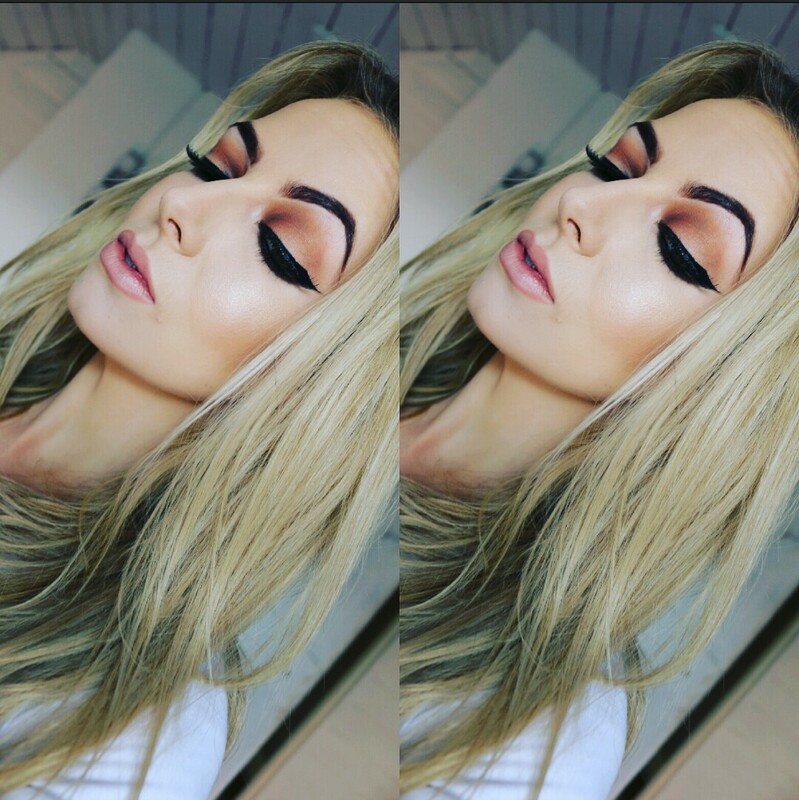 They can intensify the eye makeup and can give the illusion of a bigger eye shape. Lashes come in different lengths, thickness and styles. 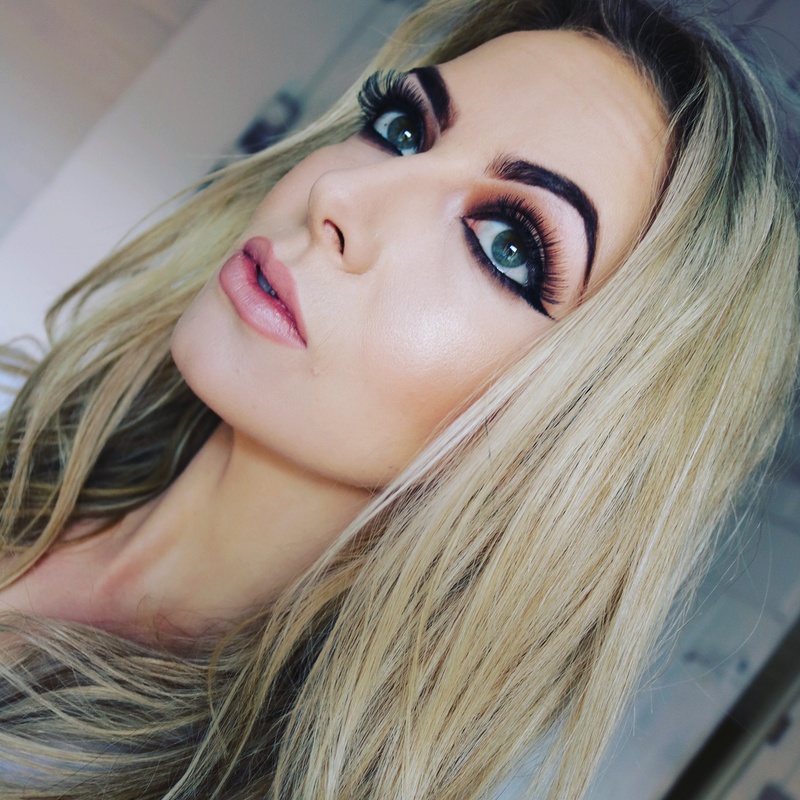 I have always found it difficult to find the perfect lashes, the brands would lack in a selection of styles or the band of the lash strip were too thick and are difficult to apply to the eyes. I Have finally found the most spectacular lashes. Baby Doll Cosmetics are an Irish company who launched in 2013 at the RDS. They have a wide range of lashes in different lengths and thickness to suit all individuals. I have been using BAbydoll lashes for about a year now and I still love them as much as day one., the quality of the lashes are amazing they are lightweight and easy to apply. 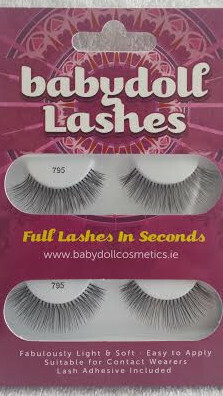 My favourite are the 870 lashes, they are an average length with a demi wispy effect. The lashes are natural but yet still achieves fullness of the eye. If you prefer more length and minimum thickness the 795 are the ones for you. I get asked so many times, what lashes i’m wearing when wearing these beauties, the 795 they are light enough for daytime use. They are perfect if you naturally have thick lashes but need to add that extra length. If you like the full dramatic look the 807 are your dream lashes, they have amazing fullness and are super dark, perfect to add definition to the eyes. Great lashes for party nights out perfect for a bold make up look. 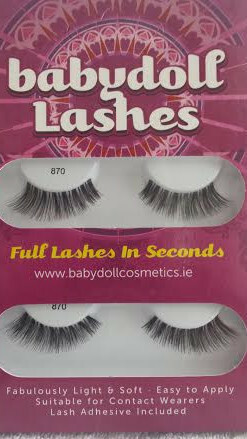 You can purchase The lashes at http://www.babydoll.ie/ , hurry up and show off them lashes girls. 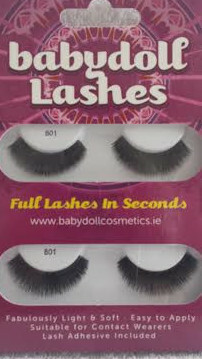 There is also new lashes just been added to the Babydoll family 704 and 711 super excited to try them. I am wearing 870 lashes in this makeup look. The morning of Catrionas wedding was so lovley and peaceful, I had an early start to get all the girls ready Catriona , her lovely bridesmaids and her adorable mam. Depsite all the laughter and her dad cracking all the jokes I was still in work mode and had her on time for her big day. 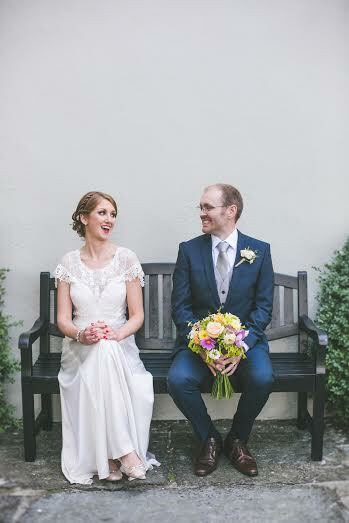 Catriona wanted a Bohemian style wedding with a vintage twist, we discussed looks in her trial and I created a look that focused on the l winged liner and a red lip. I choose MAC lady danger for Catriona MAC lady danger is so vivd and beautiful and defintely makes a statement. 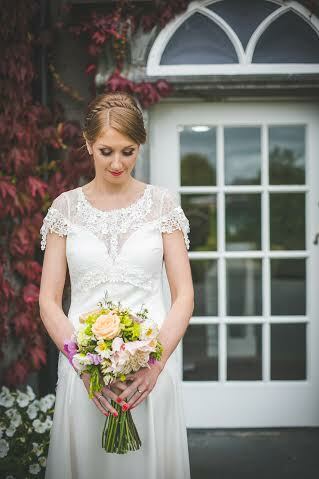 Its warm orange based undertone really complemented Catriona fair skin tone and was perfect for her wedding theme. 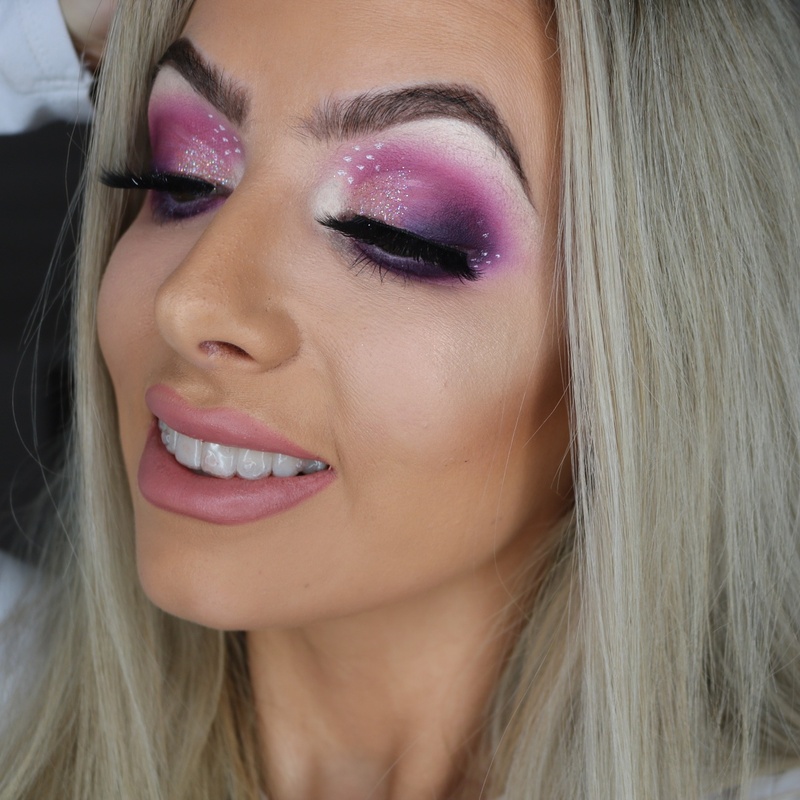 she wanted a fun creative theme with lots of colour so this suited her makeup look just perfect.. 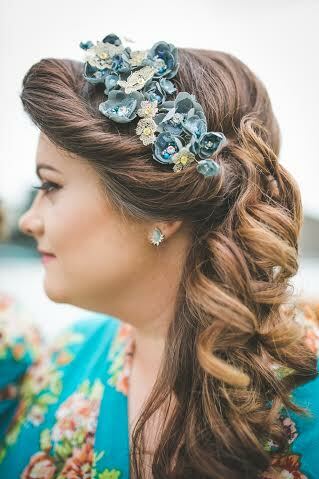 Her Bohemian style theme was elegantly brought into the the headpieces and her bouquets which were so beautiful, the colours and textures were outstanding and it really set the theme off to a tee. 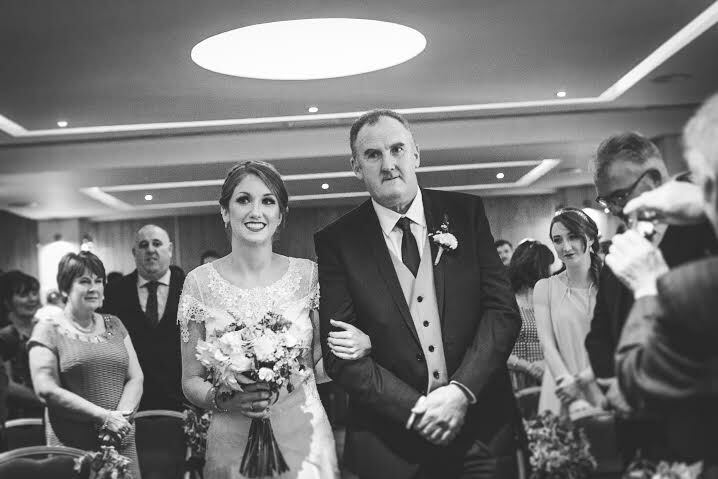 Catriona and her parents really had a special bond it was beautiful too see how happy they were for their daughter. They were the nicest poeple and made me feel so warm and welcome on the morning of catrionas wedding . The pictures below show the happinesss in their faces. Catrions dress was so classy and elegant it was perfect. Bohemian style dress had a beautifull flow an girly edge to it and the vinatge twist was introduced with the lace on the shoulders. It was Classic and timeless. Dress: ‘Wren’ by designer Claire Pettibone. 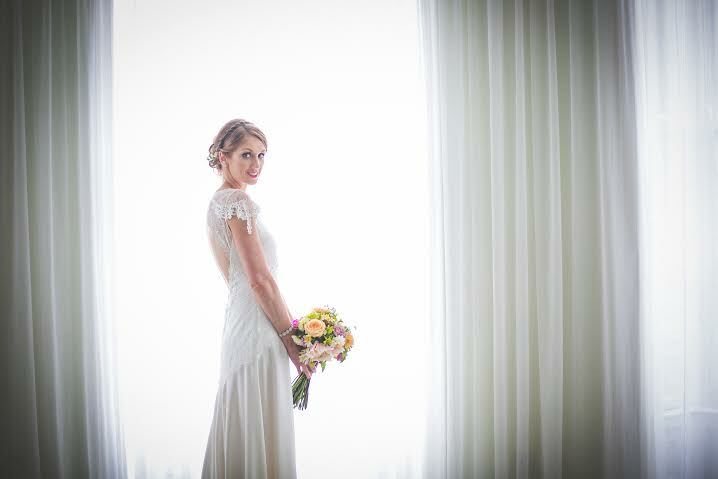 I hope Catriona had a fantastic day and hopefully we will; get to meet again soon..
Bride of the month-Kathryn Simpson. Wow this girl is so beautiful inside and out and had a fanastic story behind that beautiful smile. Kathryn and her bridal party were from all across the world, each girl with such interesting backgrounds. I was introduced to Kathryn by her bridesmaid Gracie who is living in Berlin but also a carlow native like myself. 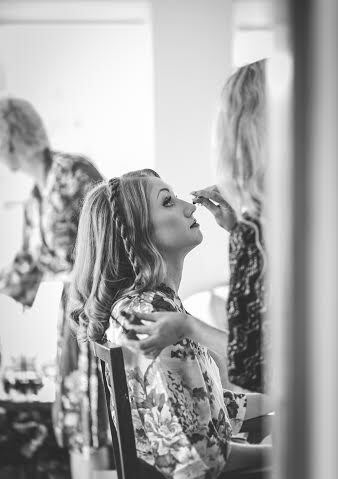 As been across the sea Kathryn and myself communicated through whatsApp where we got to know each others personalities and exchanged different looks and ideas ,which then I could put together ato create a unique look for Kathryn on the morning of her big day. 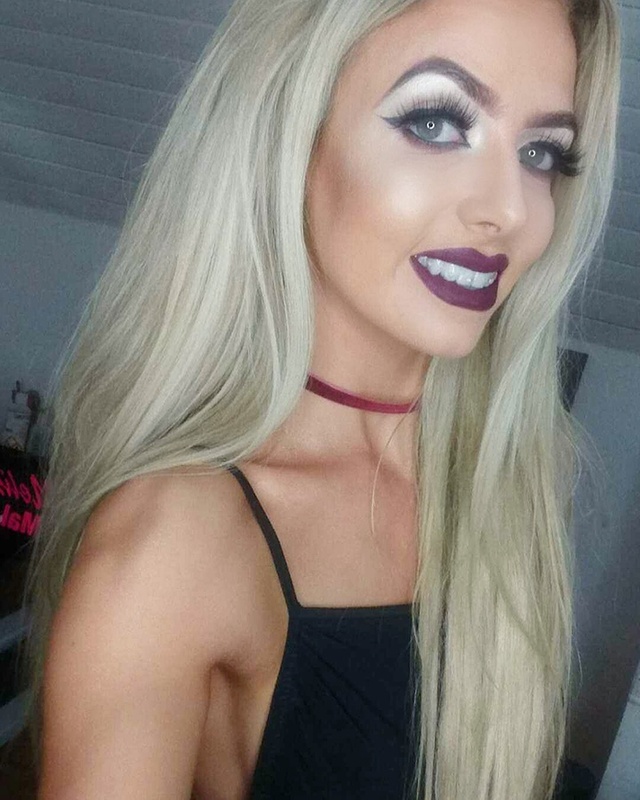 Kathryn is currently living in Manchester but orignally from Lismore, Co Waterford. After all over converstaions across the phone It was finally time to meet the bride to be. 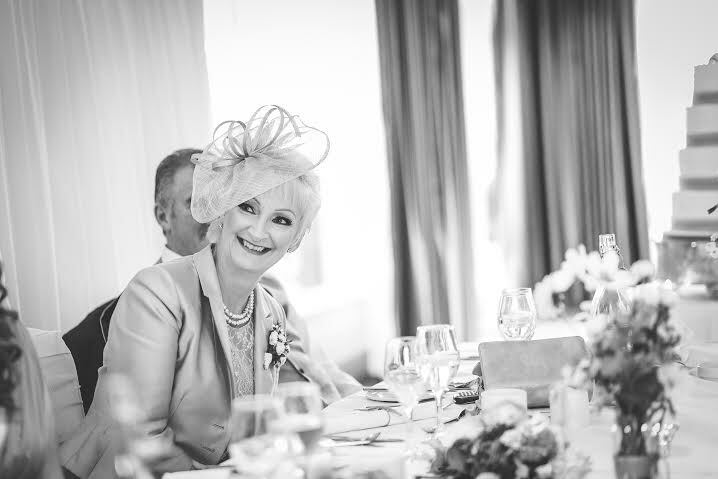 I met kathryn In Hotel Kilkenny on the morning of her wedding day. It was her dream to get married in St Canice’s Cathedral and now it was happening. 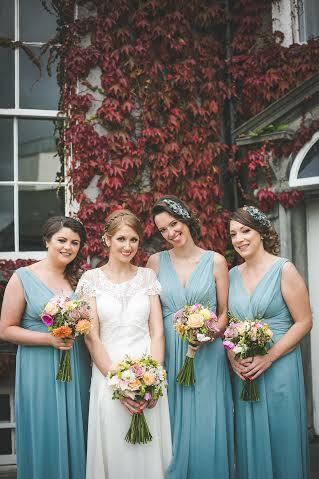 She was so calm and relaxed and enjoyed the giddle with her bridesmaids Gracie, Katie and Roxanne. Kathryn wanted a timeless bridal look, she wanted to look like herself but a better version as she says. I helped define her features while giving a long lasting flawless finish. Mac : Handwritten, kid, mythology ,brule, swiss chocolate, embark. Finished off with Mac fix + spray this excellent for setting the over makeup and keeps skin hydrated and fresh looking, also a perfect product for a bride to have throughout the day. Bridesmaids- all the girls had a different colour dresses to represent each of their personalites ,a delicate style dress whic was a soft pastel colour they were so stunning. Katies dress really enchanced her eyes, I focused on the eyes to really make that blue pop with soft coral tones with smoked lash line. Katie is from belfast and met kathryn in Belfast university. Roxanne informed me she didnt wear much makeup so I went for a soft smokey eye using soft brown tones which complemented the soft pastel green dress. Roxanne is from france,kathryn were pen pals since they were kids and remained friends ever since. So cute. I really enjoyed working with all amazing girls and getting to know all of them. The girls were all a pleasure to work with from start to finish and were beautiful inside and out.